Fitting larger tires is a good way of increasing the overall clearance height of the car. 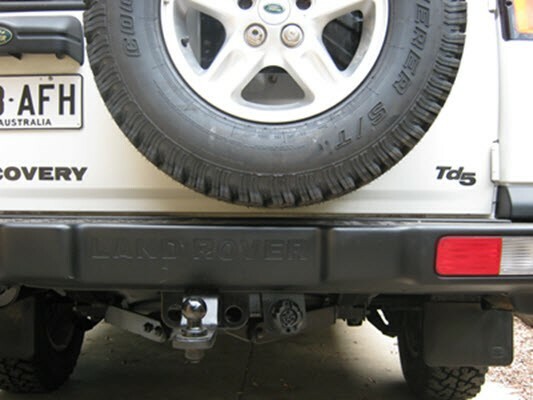 The lowest part of a Discovery is the bottom of the differential on each axle. 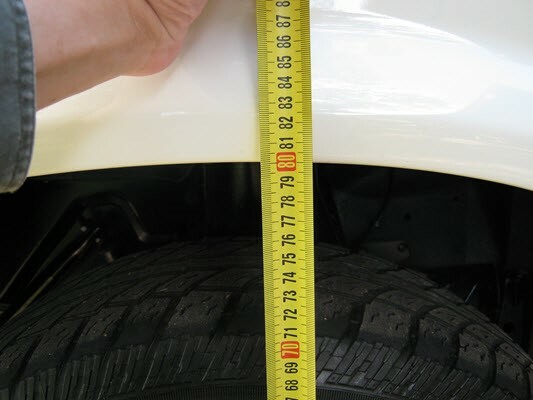 Even if you install a suspension lift kit, this distance remains the same. 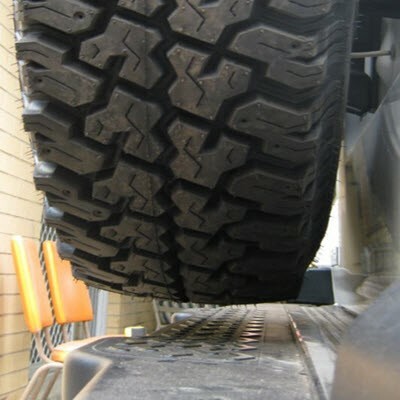 Installing a wider diameter tire increases the distance between the bottom of the diff and the ground. Maybe not by much, but there are times when every little bit of added height helps. 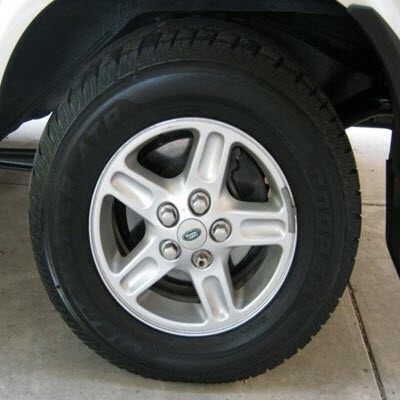 Fitting larger tires also fills up the wheel arches more and makes the general appearance of the car more purposeful.. The tires that were fitted to the car when I bought the car were Cooper ATR 235/70R16. 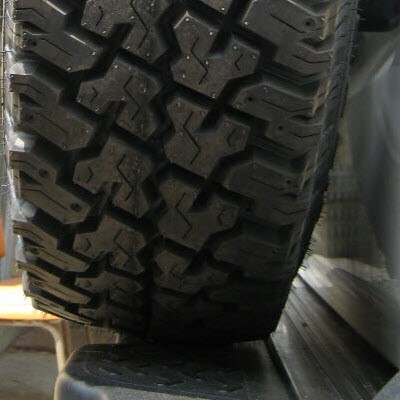 These were a good tire for driving on the road and a small amount of off road work. However, they were fairly worn and at times gave wobbly feedback through the steering when travelling at higher speeds. To get something that was better for off road use and to improve safety on the road, I decided to change the tires for a set of Cooper ST 245/75R16. 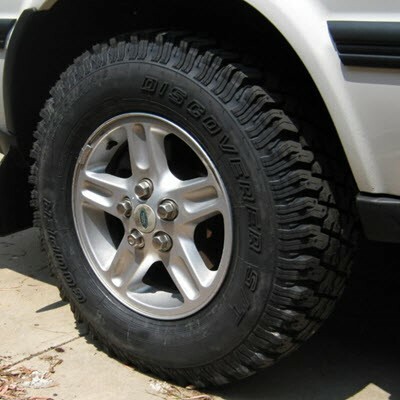 I had a set of these tires on my Discovery 1 and they performed very well so I did not hesitate in getting a set for my new car. An unexpected problem I ran into when the larger tires were fitted was the fact that the spare tire on the back door no longer fitted as it hit the rear bumper. A quick look on the internet told me that this is a common problem and was easily fixed by removing the spare wheel mounting bracket and replacing it upside-down on the door. The spare wheel bracket is removed from inside the rear door. The door card is removed and the plastic is moved out of the way to allow access into the inner of the rear door. The bracket is held in place by six bolts and two steel flat bar brackets that are probably there to spread the weight of the wheel. Once removed I inverted the bracket and put it in place on the rear door to see where it needed to be trimmed to allow for the operation of the rear wiper. This measurement was done by eye and a suitable slot was ground into the bracket. Any bare metal was painted firstly with etch primer and then satin black paint once the undercoat was dry. 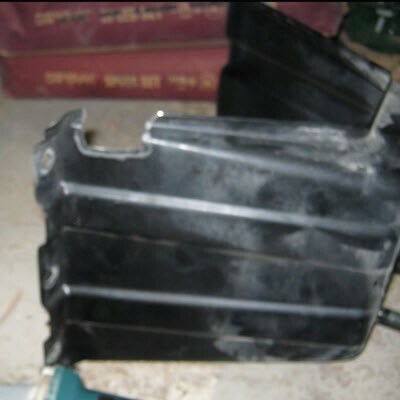 The bracket was refitted to the car, as was all the inner workings of the rear door and its door card. The spare wheel was fitted to the inverted bracket and I was surprised by just how much clearance this modification gave between the bottom of the mounted spare and the rear bumper. This can be seen in the photos below. As can be seen from the pictures below, fitting the larger tires raised the height of the car by around 4cm. WARNING – Fitting larger tires altered the accuracy of my speedo. With the larger tires, my speedo read 60km/h when in fact, according to my GPS, I was travelling at 65km/h. The difference got worse the faster the I went. Make sure that you aware of this fact when fitting larger tires. 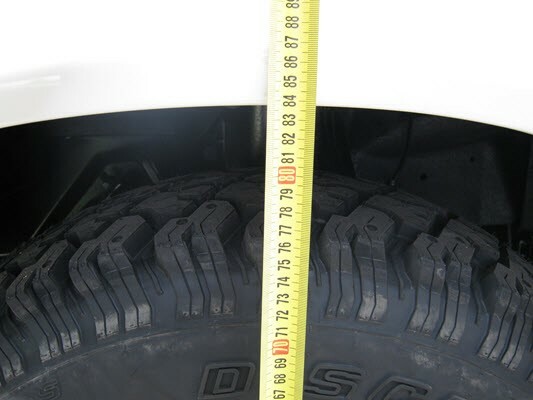 Also be aware that this increase in tire size may be unlawful in your area.